It took until week 14, but we finally got a Thursday night game with huge implications. 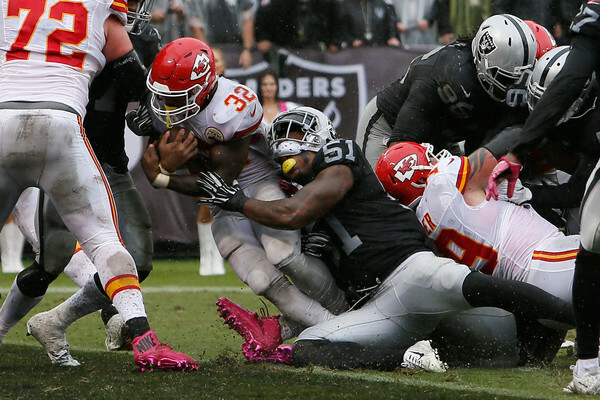 In a game that could decide the AFC West, the Raiders hit the road to face the Chiefs. For some this game is a nice reminder of what used to be one of the league’s best rivalries. While it should be quite entertaining, you can’t help but wonder if this game would be different if these teams had a whole week to prepare for this key matchup rather than a few days. The Raiders offense has been one of the most excited groups in all of football. With a fantastic line, a quarterback that has the makings to be a star, an effective ground game and an impressive receiver duo that tends to do the trick. Derek Carr has a nice matchup on paper in this one. Despite a young Pro Bowl corner in Marcus Peters and a All-Pro safety in Eric Berry, the Chiefs secondary as a whole has struggled this season. The main thing that could impact the Raiders high octane attack is the tempo(or lack there of) that the Chiefs play with. As we saw the Lions do against the Saints last week, sometimes the best way to stop an elite offense is to just keep them off the field. Despite that, Carr should still throw it plenty and should be played in all fantasy formats. While they had a bit of a platoon situation going on at running back earlier in the year, Latavius Murray has taken over the backfield in recent weeks. In his last two games, Murray has 45 total touches and that kind of volume is the music to the ears of all fantasy players. The Chiefs defensive line is stout against the run, but with the projected workload and Murray being used more in the passing game, he should still be active in fantasy lineups. Amari Cooper and Michael Crabtree as usual, should be the targets of Carr early and often in this game. With Peters playing mainly on the left side of the field, the matchup projects to be better for whichever of the two lines up more on the right. That would be Cooper in this instance, and it showed earlier in the season when these teams squared off. In that game, Cooper had 10 catches for 129 yards while Crabtree had just two catches for ten yards. If Crabtree is unable to create separation from Peters, this could increase targets for Seth Roberts who plays frequently with the Raiders consistently in three wideout formations. Despite the many jokes around the internet regarding Alex Smith and the conservative Chiefs offense, it has been winning games. Smith obviously isn’t putting up earth shattering numbers, but is doing what’s asked of him. With a cold night on slate in Arrowhead, I wouldn’t expect to see Smith throwing it all too frequently. From a fantasy perspective, he might be most valuable for his legs with the Raiders being gashed on the run in recent weeks. That means the Chiefs figure to involve Spencer Ware early and often. Ware had a monster performance against these teams earlier in the year, and in the past three weeks the Raiders have allowed almost 400 yards and over five yards an attempt to opponents. Throw in his receiving ability out of the backfield and Ware looks like a lock for 25 plus touches in this one. While Ware hasn’t been very efficient running the ball in recent weeks, Charcandrick West hasn’t received the opportunities you’d expect but remains a name worth monitoring. With Jeremy Maclin returning, the Chiefs receiving corps is now the healthiest it has been in weeks. While the Raiders secondary is beatable, it’s trust to trust many of the Chiefs pass catchers not knowing how many times they’ll try and attack through the air. The one player you can feel safe with in terms of fantasy production is Travis Kelce. In Maclin’s emergence, the dynamic tight end took his game to another level having 100 yards or more in three of the four games. With the ability to win at all levels of the field, Kelce is one of the most complete players at his position in the entire league. Maclin should see five to seven targets, but in what figures to be frigid temperatures, there is no telling how his body will react. Tyreek Hill is obviously a big play threat waiting to happen, and while he should see his touches we don’t know how Maclin’s return would impact that. Hill has all the makings of a “boom or bust” fantasy option tonight as a third receiver or flex option. With a potential division title and top two seed in the AFC on the line, this one should be extremely close. I could really see it going either way, but my guess is in this weather the Chiefs ball control offense figures to really make a difference. My prediction is Raiders 21 Chiefs (-3.5) 24. This entry was posted in NFL, Picks against the spread, Week 14 predictions and tagged 2016 NFL Predictions, 2016 week 14 fantasy football predictions, 2016 week 14 predictions, Alex Smith, Amari Cooper, Charcandrick West, Derek Carr, Eric Berry, Jeremy Maclin, Kansas City Chiefs, Latavius Murray, Marcus Peters, Michael Crabtree, NFL, Oakland Raiders, Picks against the spread, Seth Roberts, Spencer Ware, Travis Kelce, Tyreek Hill. Bookmark the permalink.